The Ada Witch is perhaps one of western Michigan’s most famous ghosts. It is unclear how the title “witch” got attached to her name—or even what her true name might be—but that’s what locals call the adulterous specter who is believed to haunt Findlay Cemetery and Honeycreek Road in Ada Township. 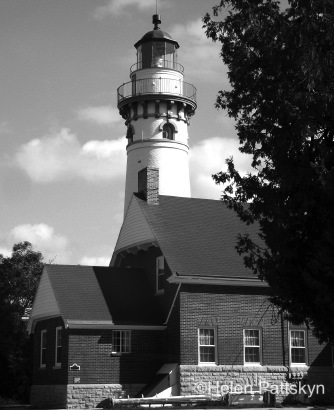 Ada is a small community, located a little more than 10 miles east of Grand Rapids and first settled in 1821. It was in those early years that many believe the so-called “witch” met her tragic end, an end she may have brought upon herself. 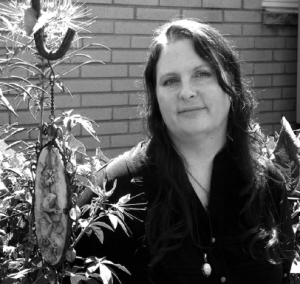 One website dedicated exclusively to the legend of the Ada Witch claims that she died in the year 1868. It is impossible to verify that date, however, as neither the woman’s name nor the actual whereabouts of her grave are known for certain. We can only speculate. The story says that the woman known as the Ada Witch was having an extramarital affair and would meet secretly with her lover in the marshes outside of town, near what is now Honeycreek Road. When her husband became suspicious of her late-night comings and goings, he followed her and caught her in the arms of her lover. In a jealous rage, the husband murdered first his wife and then the other man. During the struggle with his wife’s lover, the husband was also fatally wounded and died a short while later. Perhaps that’s why some people report not only seeing a mysterious ghostly woman wandering the area, but also a pair of ghostly men—maybe the men are the Ada Witch’s husband and her lover. The woman is believed to be buried in Findlay Cemetery, but nothing is noted in the stories about where either of the two men might have been interred. Although no one can prove that the gravestone is hers, locals believe that a broken old headstone near the back of Findlay Cemetery is that of the legendary Ada Witch. Visitors often light candles or leave trinkets for her there. Several paranormal investigators have been to the cemetery and believe that it is indeed haunted. There is evidence in the form of orb photos and other unusual phenomena that have been caught on film and on digital cameras. Of course, just as there are many people who believe the story is true, there are just as many who think the Ada Witch is little more than an urban legend. In her book Ghosthunting Michigan, author Helen Pattskyn explores 30 of the scariest spots in the Wolverine State, all of which are open to the public—so you can test your own ghosthunting skills, if you dare. Professional ghosthunters, like the folks from Motor City Ghost Hunters, use some pretty sophisticated—and expensive—equipment. Chances are, that’s more of an investment than the average person wants to make. The good news is that the weekend ghosthunter can get by—and still get good results—with just a few ghosthunting tools. A good-quality digital camera is an absolute must, and the greater the resolution (the more pixels) the better. I use the camera that I bought a couple of years ago for vacations. It has the added bonus of being small enough to fit easily in my purse. I use rechargeable batteries—but always carry a backup set (except for that one time at the Baldwin Theatre, the one time I needed them!). It is commonly reported that batteries die and electronics stop working in haunted places. A second indispensable piece of equipment, according to everyone I spoke to, is a digital recorder. Most digital recorders are small and inexpensive. All of the ones I looked at had a record time of several hours. Digital recorders are used to pick up EVPs, or electronic voice phenomena. Paranormal investigators frequently seem to record sounds and even voices on electronic devices, even when no sounds or voices were heard by the team members themselves during the investigation. 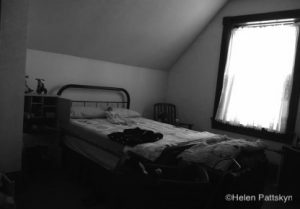 Many paranormal teams post these recordings on their websites, allowing visitors to decide for themselves whether the “voices” caught on tape are real or just white noise. A digital camera and digital recorder were the only pieces of equipment I took with me on my adventures around the state, and I really only used my digital recorder a few times. I left it on all night when I stayed at the Blue Pelican—but if anyone was there, they didn’t feel like talking to me. Probably the next most popular ghosthunting device is an EMF detector, which is used to detect electromagnetic fields. The theory is that, where there are ghosts, the electromagnetic fields “spike.” Other things can cause electromagnetic fields to jump, too, such as outlets and major appliances. So you need to have an idea of what’s in the area before jumping to conclusions. Natural and man-made (not paranormal) electromagnetic fields can cause people to have that same “eerie feeling” so many people get when they believe there are spirits nearby. Bearing in mind that you get what you pay for, weekend ghosthunters can purchase a decent EMF meter for $30–$50 from most larger hardware stores. More expensive models start at $100. A couple of the paranormal investigators I spoke to recommend using a 35mm camera, preferably loaded with black-and-white film, as a secondary source for ghostly images. If you’re going out with a friend, it might be interesting to compare images taken with a digital camera and the good old-fashioned way with film. If you’re more serious—or as you become more serious—you can purchase additional equipment for your ghosthunting arsenal. Full-spectrum digital video cameras are popular, as are night vision or infrared camcorders. It has been suggested to also document your adventures with pen and paper—or maybe start a ghosthunting journal or blog. Helen Pattskyn is the author of Ghosthunting Michigan. Despite its name, the Holly Hotel is no longer an inn and does not accommodate overnight guests. However, the dining room remains a favorite spot for dinner, afternoon tea, and Sunday brunch. Dinner is served nightly, while a traditional Victorian-style high tea is served every day except for Sunday. The restaurant’s menu is an award-winning blend of traditional signature dishes, some of which have changed very little over the last century, and contemporary seasonal fare. 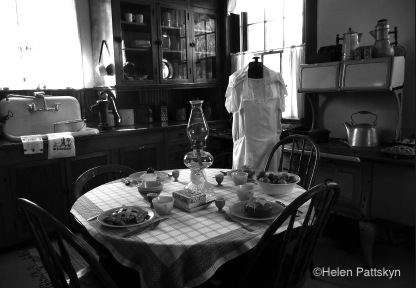 In addition to being featured in magazines and on television for its ghosts, the Holly Hotel is known nationally for its fine cuisine. In fact, the Holly Hotel has been the sighting of a number of apparitions over the years. One of the most frequently seen is believed to be the spirit of Nora Kane, a former hostess of the inn. Many guests claim to have seen her in the bar area and in the back hallway, which used to be the main entrance to the hotel. 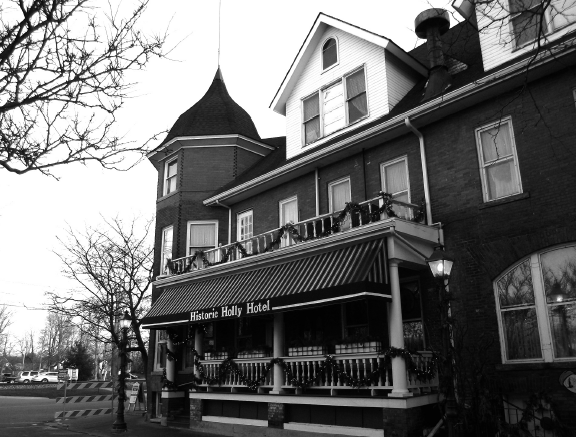 The inn’s most famous ghost is probably former owner Mr. Hirst, who passed away in the 1920s, but who, many believe, has never let go of his hotel. He is reputed to be the most active—and most unhappy—when renovations have been made to the property. A myriad of other spirits are said to inhabit the 120-year-old building. Helen Pattskyn visited the Holly Hotel and interviewed the staff and owner. Find out all about their ghostly tales in her book Ghosthunting Michigan. Is the Whitney in Detroit Haunted? 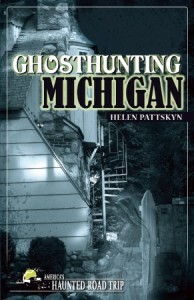 Helen Pattskyn, author of Ghosthunting Michigan seems to think so. Here is her tale. 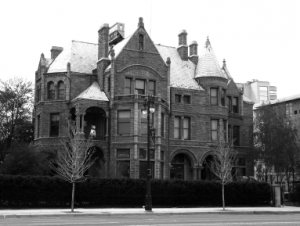 Located on Woodward Avenue, just a few blocks from the campus of Wayne State University and Detroit’s cultural center, the Whitney was once one of the city’s oldest and most beautiful private residences. Now it is one of the city’s finest and most beautiful restaurants. I’ve only been there to eat on a couple of very special occasions, but I fell immediately in love with the grand old house. Of course, prior to my visit on a bright sunny afternoon in April, I had only gone in looking for after-theater drinks and dessert with friends, not hoping for a glimpse of the ghost of former owner David Whitney Jr. There are 20 fireplaces throughout the house, a secret vault hidden in the original dining room, and an elevator. 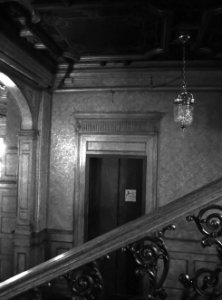 A haunted elevator, according to stories. In addition to the beautiful dining rooms on the main floor, there are outdoor gardens that host parties all summer long and the Ghost Bar up on the third floor. When I spoke to David, one of the many wonderful staff members, I asked him if he had ever had any unusual experiences while working there—or if maybe any of his coworkers had seen or heard anything out of the ordinary. “We have a lot of the usual stuff, I guess,” he told me. “Doors sometimes shut as if by themselves. And one woman who used to work here told me that she was walking through the Great Hall when one of the crystals, from one of the chandeliers, fell right at her feet and shattered. It kind of freaked her out a bit. Of course, that might not have had anything to do with anything supernatural,” he cautioned. “And if you knew her . . . she’s a bit of a spirit herself,” he added with a chuckle. One of the most haunted places in the building is said to be the elevator, especially where it opens up onto the second floor. Not only did David Whitney Jr. pass away in the house, but his wife, Sara, also died there. Numerous employees have reported that the elevator will start moving on its own and that the doors open and close without anyone pushing the button. I meandered up the stairs to the third floor to visit the aptly named Ghost Bar. The bar wasn’t open yet, but the bartender was setting up. He gave me a friendly “hello” and asked how I was doing. “I’m doing great, thanks,” I answered. Then I told him that I was writing a book about haunted places and that, naturally, the Whitney had come up. He told me that the first incident had occurred during a wedding in which the entire mansion had been rented out. “The way they run it is pre-dinner drinks are up here, then they serve dinner downstairs, and then we reopen the bar for post-dinner drinks,” he told me. “There weren’t very many children at this wedding, but there was this one little girl. She was maybe five or six and she kept running around and she didn’t want to sit still. Her mom asked me if I’d mind keeping an eye on her for a few minutes, so she could go down and get something to eat. Everyone else had gone downstairs by then, and I really didn’t mind, so I said ‘sure’ and let the mom go downstairs. I left the little girl alone in this room, and I went into that room over there,” he pointed to one of the sitting rooms adjacent to the bar. “I was in there cleaning up, and, all of the sudden, I heard this shriek, so I came running out to see what had happened. The little girl had this look on her face, like she was totally terrified. I didn’t see anyone—or anything—so I asked her what was wrong. She told me that a big ball of light had flown out of one corner of the room and came right at her. And she was really frightened,” he emphasized. The bartender said that as his customer was settling up his tab, he’d finally calmed down enough to admit that he’d seen the silhouette of a man standing behind him in the mirror behind the bar—but when he turned around, nobody was there. Enjoy Ghosthunting Michigan from the safety of your armchair, or hit the road using the maps, “Haunted Places” travel guide, and “Ghostly Resources.” Buckle up and get ready for the spookiest ride of your life. 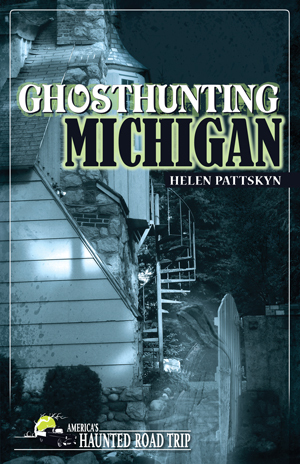 In her book Ghosthunting Michigan, author Helen Pattskyn explores 30 of the scariest spots in the Wolverine State. 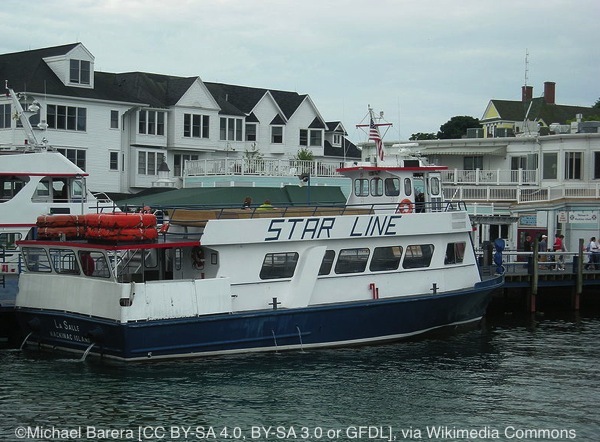 Today, she takes us on a tour of Mackinac Island. Earlier in the year, I visited Mackinac Island, which is supposed to be one of the most haunted places in the state of Michigan. It seemed little wonder, given the age of the settlement. 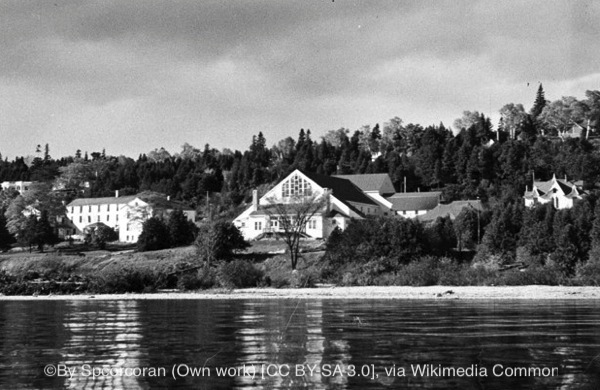 Even before Europeans arrived in 1634, the island was inhabited by members of the Ojibwa tribe, who considered the island to be the home of the “Gitche Manitou,” or “Great Spirit.” Unfortunately, while I had a great stay, during the first two days I was there, the only people I met were seasonal employees who either didn’t know anything about the island’s hauntings or didn’t want to talk about them. On my last day, I decided to get up early, walk into town, and talk to a few of the locals. They were much more helpful. 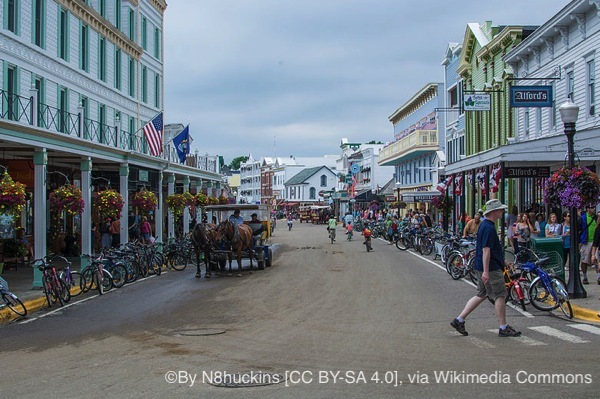 The island is a popular summer destination for Michiganders, most of whom come to get away from the city for a few hours and indulge in Mackinac’s most famous commodity: fudge. I could easily have gained 10 pounds in one weekend alone if it weren’t for all the walking I did, and my family would not have let me back in the door if I hadn’t brought home a half pound each of everybody’s favorite flavors. 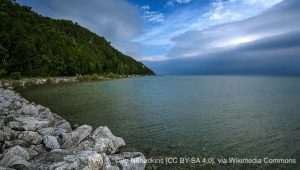 Mackinac is accessible only by boat or small plane, and there are no motor vehicles permitted on the island. To get around, visitors walk, rent bicycles, or take a horse-drawn cab. Horses can also be rented for exploring the island’s many beaches and trails. While many people only go for a day trip, I visited in the off season and got a great deal on my hotel room, proving that it doesn’t have to be as expensive of a weekend getaway as a friend had warned me it would be. I stayed at the Mission Point Resort, which is so well known for its ghosts that the resort was visited by the crew of the SyFy channel’s Ghost Hunters in March 2011. When I visited the Baldwin Theatre, administrative manager Vonnie Miller told me a story about her experiences on Mackinac Island. 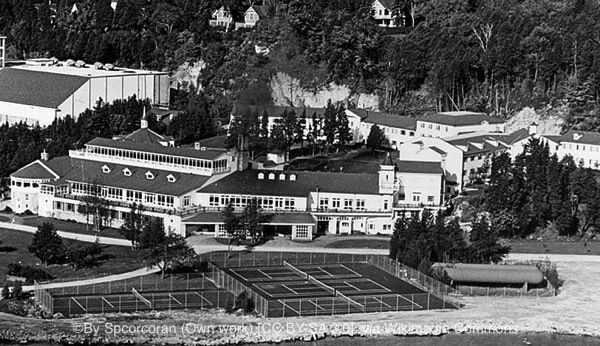 When Vonnie was a teenager, she visited the island and snuck out one night after curfew. She couldn’t recall exactly where in town she’d been, just that she looked up to see a man standing under a light, watching her. She was sure she was going to get caught—only a second later, the man was gone. Vonnie told me that after she saw that, she hurried back to where she was supposed to be staying. I did a little nighttime investigating at Fort Mackinac when I was on the island. 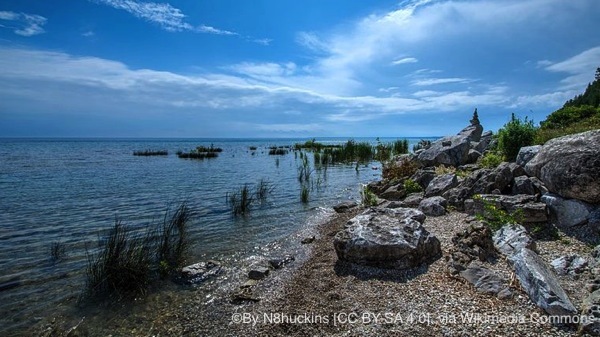 The British built the fort in 1780, and it was the scene of two battles during the war of 1812. Allegedly, the spirits of many long-dead soldiers still patrol the fields behind the fort at night, perhaps not realizing that they’re dead and the war is long over. I didn’t see any ghosts, just a few bats . . . but it was kind of dark, and maybe I was just a little bit nervous being up there all by myself at 11 o’clock at night. I’d just taken the walking ghost tour. 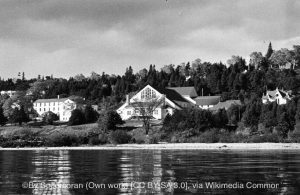 In addition to the walking tour, sponsored by the bookstore in downtown Mackinac, the Mission Point Resort has started a yearly tradition of hosting a “haunted weekend” in September. 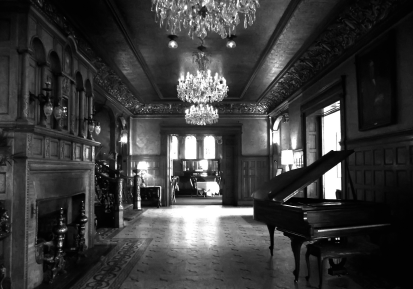 Guests booked into the special package are given the opportunity to participate in a real paranormal investigation and decide for themselves if the place is actually haunted. When I go back for another visit, I’m not only going to schedule more time to explore the rest of the island, but I’ll probably stay at the Cloghaun Inn, a little bed-and-breakfast in the heart of town. According to the owner of the coffee shop where I ate breakfast on my last day, the bed-and-breakfast is “definitely haunted.” I stopped by to talk to the owners before I left, but they were in the middle of breakfast service, and I had to catch my ferry home. Not that I’m looking for an excuse to go back or anything. . . .